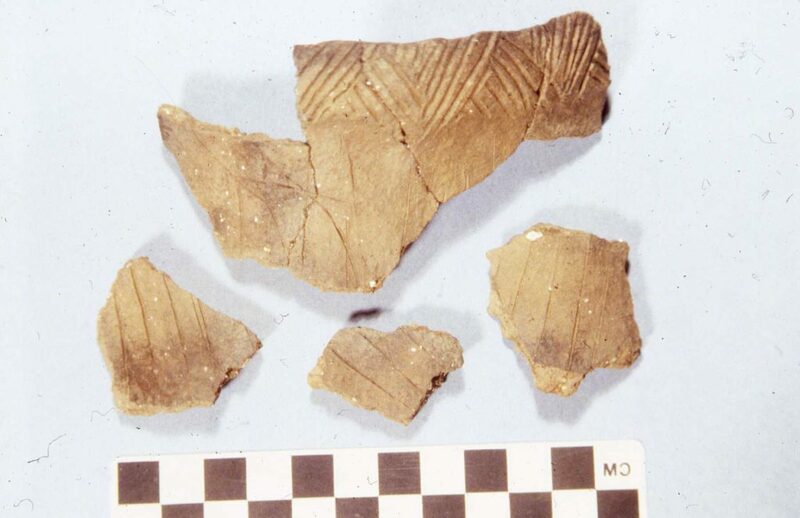 Morgan Site (6HT120): Morgan is an 11th –14th century Native American village site on the Connecticut River in Rocky Hill. The site’s excellent preservation provides a striking example of the complexity of late pre-contact lifeways (diet, shelter, trade, spirituality) at the time Europe was experiencing the Dark Ages and the plague. Five radiocarbon dates were obtained from cultural features: A.D. 1065 +/- 45 (directly on a maize kernel submitted by archaeo-botanist Dr. Lucinda McWeeney), 1170+/90, 1170+/-70, 1320+/-70, and 1360+/-70 years. The site was originally excavated over a c. five-year period in the 1980s by members of the Albert Morgan Archaeological Society under the co-direction of AMAS dig chair David Cooke and professional archaeologist Dr. Lucianne Lavin. 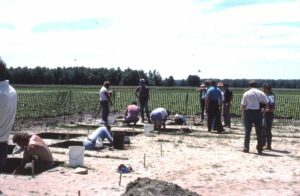 Excavations in the early 1990s were directed by AMAS dig chair Fred Gudrian. The site was open to the public and used as a teaching facility to educate visitors and aspiring amateur archaeologists in the rudiments of professional excavation techniques. Thousands of artifacts were recovered, most of them made of clay. 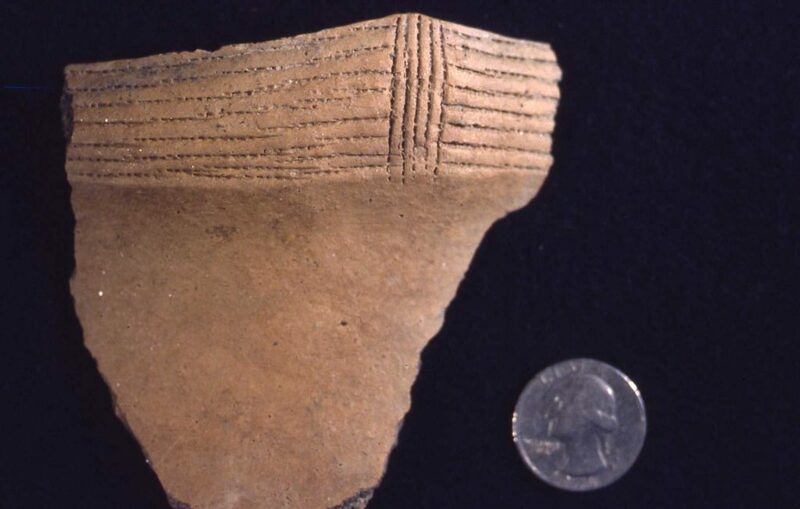 They included over 13,600 pottery shards representing at least 144 vessels; 49 elbow pipe fragments representing at least 41 pipes; and 44 unfired clay coil fragments. Smaller numbers of a wide variety of stone tools were also found – approximately 3,250 tools, cores and debitage of quartz, quartzite, chert, hornfels, siltstone, and basalt; only five jasper flakes were recovered. The tools included stone tips of arrows; scrapers, drills, choppers, hand spades; hoe bits, pitted stones, grinding stones, hammer stones, a shallow mortar for crushing stone temper (identified by primitive technologist and expert pot manufacturer Robert Karalus), pestles, adzes, celts, and utilized flakes for general cutting and scraping activities. The alkaline soil (6-8 ph range) and continual silting over of the site by Connecticut River spring freshets allowed for excellent preservation of dietary remains, including hundreds of animal bone antler, and teeth fragments, seeds, wild rice, nut shell fragments, plant tubers and other remains, maize kernels and one bean fragment. The majority of fauna appear to have been white tailed deer, but smaller mammals, bird, turtle, fish and marine shellfish were also present. The 35.5 by 60 foot block excavation contained features upon features that included small disk-shaped hearths, deeper earth ovens and storage pits, refuse pits, a large, shallow heavily burned pit possibly used to fire clay pots, circular post molds representing rotted wooden poles for houses and food processing racks, and two burials with flexed human remains. [Drop box: Connecticut archaeologists do not knowingly excavate Native American graves. In fact, Connecticut has laws against disturbance of all cemeteries and graves, regardless of their age or ethnic affiliation. Unfortunately, burial pits are sometimes accidentally unearthed within a residential site, possibly because in the winter the base camp or village contains the only unfrozen ground for burial of the deceased. When this occurs, state law demands that all digging stop and that the Office of State Archaeology be notified. The State Archaeologist notifies members of the Native American Heritage Advisory Council, which includes representatives of each of the State’s five recognized tribes The five existing Connecticut tribes, recognized by both the Colony and the State of Connecticut from earliest European settlement to the present are: Schaghticoke Tribe with a reservation in Kent; Golden Hill Paugusset Tribe with reservations in Trumbull and in Colchester; Eastern Pequot Tribe with a reservation in Stonington; Mashantucket Pequot Tribe with a reservation in Ledyard; Mohegan with a reservation in Montville], who decide whether to leave the deceased and burial in situ or to rebury the remains elsewhere and the procedures for doing so. Individual storage pits contained a complete pot, a cache of antler, and a bone dagger and its sharpening stone. The dagger and sharpening stone were found at the base of an adult burial, a 40-50 year old male. The second burial, that of a 5-6 year old child, contained a quartz Levanna point, the upper jaw of a white tailed deer, and a box turtle shell. Neither of the faunal remains showed evidence of processing, burning or calcinations. Roentgenograms, photographs made from X-rays, were taken of the turtle shell to determine if it were used as a rattle. The photos showed a deer toe bone inside the rattle and a large quartz fragment blocking the neck opening, strongly suggesting that it was a rattle; its location in the grave suggests it was strapped to the child’s leg. Both burials appear to have been flexed, and both faced east toward the river. The child headed north while the adult headed south, an important direction for local indigenous peoples who believed that the Creator’s home, and that of good spirits, was in the Southwest. Analysis of the adult skeleton showed him to be six foot one inches tall and with some health problems. Lipping on some of the back vertebrae showed slight osteoarthritis; loss of bone on the upper jaw and loss of all molars indicates periodontal disease. The left shinbone showed evidence of osteomyelitis, which spread to the ankle causing arthritis and deformity of the left foot; these skeletal pathologies indicate that the man walked with a profound limp if he were able to walk at all. Chipped stone bifacial tools and a piece of worked graphite. The silver gray graphite was scratched off with a needle or awl and mixed with animal or plant oil to make paint pigment. Late Woodland Levanna projectile points. Some Hudson Valley pottery style rim shards, demonstrating social contacts between the Morgan village and New York communities. Clay pipe bowl fragments & a clay flute/whistle fragment from the Morgan site. Both plain and decorated pipe bowls occurred. 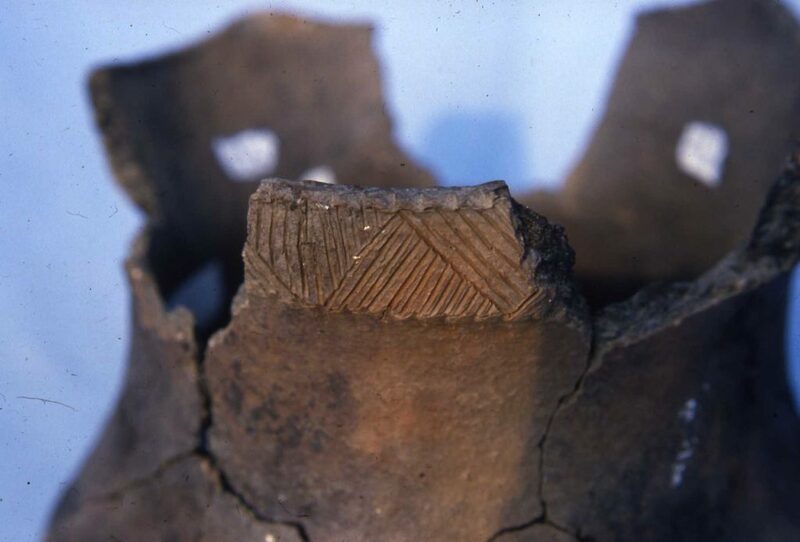 Most common decoration was incising followed by brushing, punctation, and linear dentate stamping; one bowl was cordmarked. Smoking pipes are very rare on New England sites. Unlike their European counterparts, indigenous peoples did not smoke for recreation. Smoking had spiritual/political and curing functions. The relatively large number of pipes at Morgan suggests either they were being manufactured there or that it was the locus of a socio-political gathering(s). Quartz Levanna arrow point at top of feature near large deer bone. Chipped stone hand spades, found at the top of pit feature 20. Windsor hoe bit made from basalt. Shallow stone mortar for grinding stone temper. Basalt ground stone tools: pestles, Windsor hoes, celt and adze fragments. 1991 Two Prehistoric Human Skeletal Remains from the Morgan Site, Rocky Hill, Connecticut. Bulletin of the Archaeological Society of Connecticut 54:13-20. 1988 the Morgan Site: The Beginning. Bulletin of the Archaeological Society of Connecticut 51:3-6. 1996 An Analysis of Lithic Artifacts from the Morgan Site in Rocky Hill, Connecticut. Bulletin of the Archaeological Society of Connecticut 63:3-24. 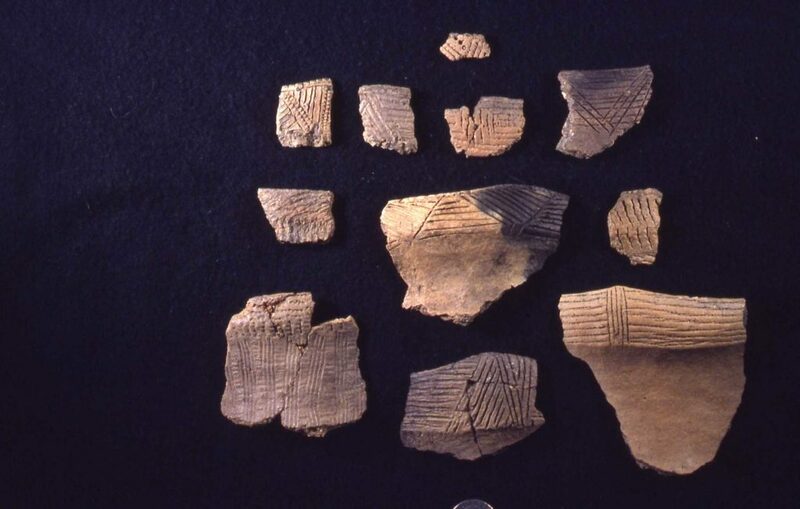 1995 An Examination of Late Woodland Ceramic Pipe Fragments from the Morgan Site in Rocky Hill, Connecticut. Bulletin of the Archaeological Society of Connecticut 58:13-29. 1988 The Morgan Site, Rocky Hill, Connecticut: A Late Woodland Farming Community in the Connecticut River Valley. Bulletin of the Archaeological Society of Connecticut 51:7-21. 1993 Prehistoric Pottery from the Morgan Site, Rocky Hill, Connecticut Bulletin of the Archaeological Society of Connecticut 56:63-100.